Mini Countryman Interior, Sat Nav, Dashboard | What Car? Electric adjustment is available for the front seats and the optional sports seats are both comfortable and supportive under moderately hard cornering. Unsurprisingly, the standard seats are fractionally more comfortable, but it’s a shame that adjustable lumbar support is only offered as part of the expensive electric seat and memory pack upgrade. The spring-loaded backrest is also tricky to adjust in small increments and the release lever is awkwardly placed. The steering wheel has both reach and height adjustment that, in combination with the seat, allows both very tall and very short drivers to get comfortable. The dials are attached to the steering column, making them easy to read, and a head-up display is optional on all trims. The retro toggle switches in the centre of the dashboard look good, too. 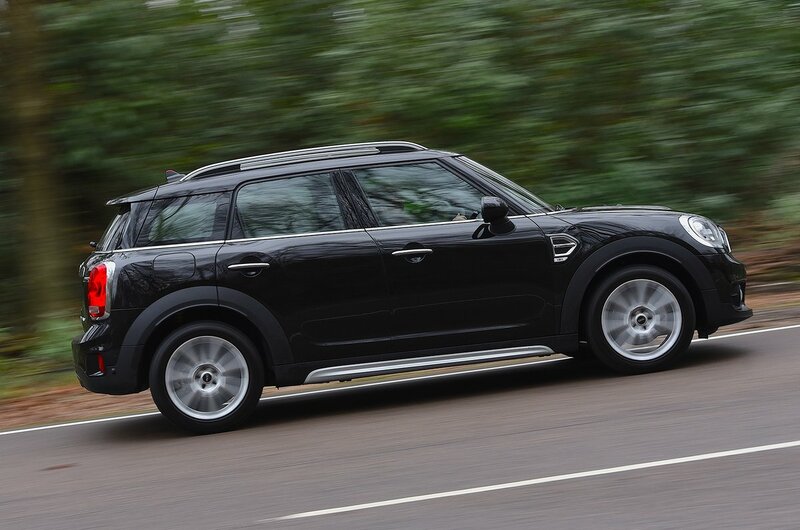 Although Mini calls the Countryman an SUV, it feels much more like a conventional hatchback from behind the wheel. It may have slightly raised ground clearance and a tall roof, but the Seat Ateca and Nissan Qashqai tower over you. Forward visibility is pretty good, though, with that tall screen and the bulbous, rounded headlights making it easy to judge the edges of the car. Thick pillars front and back can make for tricky visibility over your shoulder and when approaching junctions, though, and the small rear windows mean it can feel a little dark for those in the rear. The good news is that rear parking sensors are standard, while front parking sensors are fairly affordable. Should you want even more reassurance, a rear-view camera is also available. All versions of the Countryman get a DAB radio, Bluetooth, USB connection and sat-nav. While a fairly small, 6.5in screen is standard, there’s the option of an 8.8in touchscreen with a sharper display as part of the Navigation Plus Pack. Both get a rotary dial between the seats that makes controlling the infotainment system easy, plus the head-up display can be used to do things like select radio stations or view sat-nav prompts. It was destined to be a good set-up, though, because it’s essentially BMW’s class-leading iDrive system. That means easy-to-navigate menus and clear graphics. The top-spec Navigation Plus system is certainly a good one, with plenty of online functionality, but it’s an expensive option. Thankfully, this generation of Countryman improves on the previous model; there are far more soft-touch plastics around the dashboard and tops of doors. Move further down and you will find harder, scratchier plastics, but for the most part they aren’t too noticeable. The Countryman retains Mini’s trademark toggle switches in the centre of the dashboard. These feel impressively solid and look like they’re actually made of metal. The other switches aren’t quite as industrial, but they do click with a pleasing precision.